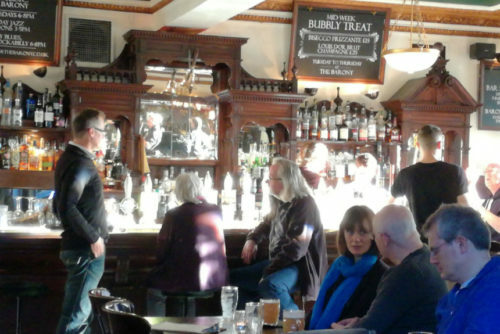 The sun shone, the beer, cider and wine flowed and the jazz band played on….at The Barony Bar, 81-85 Broughton Street, EH1 3RJ last Saturday. The Barony Bar offers jazz on Saturday afternoons 3-5 pm with various guest bands. I was lucky enough to catch the Martin Kershaw Trio on March 24.One of the leading musicians on the vibrant Scottish jazz scene, alto saxophonist Martin Kershaw played again at The Barony joined by Graeme Stephen (guitar) and Brian Shiels (bass). There is trad music on Tuesdays 6-8 pm and blues on Sunday eves. There is also a new menu – I was back at The Barony on Tuesday eve for some fiddle and some very good goulash with egg noodle and sour cream. My friends took advantage of the two burger deal for £15 and the fish and chips – looked like a small whale had been battered and deep fried as it lay on its final resting place of chips with skins on – I exaggerate – but v generous fish portion! These new changes at The Barony along with fresh flowers and candles mean its worth booking a table for food and music. Telephone: 0131 556 9251 to make a reservation.